It's all going really well here. Been really busy and Asha and I have both been battling colds for a while now. That's the bad part about day care is all the stuff that gets passed around. Luckily Asha has missed most of it and just has this cold that won't go away but I'm thankful it hasn't been croup, pink eye or strep like all the other kids seem to be getting. My job is going great and it really is my dream job. I have been trying to find a job like this for probably 10 years now and it just kind of fell in my lap. I truly feel blessed to have it and have no intentions of ever leaving. We are both anxiously waiting for spring/summer so we can get outside and have fun. She is already talking about wanting to have picnics when it gets warmer. We are having fun with the winter yet though. 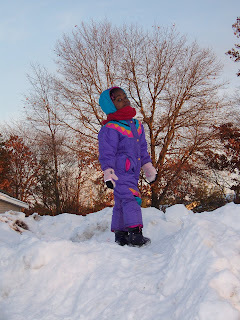 Last weekend I took her ice skating for the very first time this winter and then she did a little sledding on the big snow pile in front of our house. 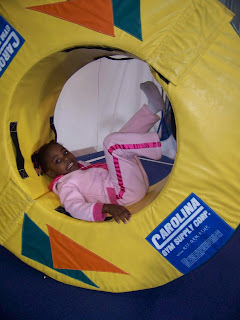 We also do the open gym on Saturdays for her gymnastics and with that you can use any of the equipment for 2 hours so we really have fun doing that when it's too cold to be outside. I will be signing her up for 4K this week. 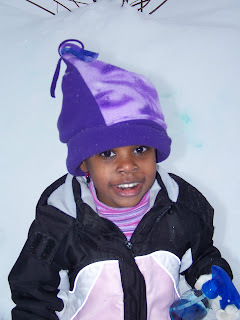 I can't believe she is going to be 4 next month and old enough to start going to school in the Fall. She's a little worried about it and I'm not sure where I'm going to have her go yet but I'm sure it will all work out. I am excited for her birthday. I took the day off since her birthday is on a Friday and I have promised to take her to get her ears pierced. I am a little scared but she has been begging since before Christmas so I figured I would take her and hopefully I won't regret it. Not sure if we will have her party on her birthday or on Saturday but I am also going to get her a bike. It will be her first bike and I'm so excited for that. Up until now she has been riding her trike and I really think she will love a regular little bike with training wheeels. I can't wait to see her face when she gets it. Well here are some new pictures of our fun in the last month or so. Here she is coloring snow green. I put food color and water in a spray bottle and let her go to town. She loves it. Her new favorite thing is to color ice chunks different colors. It actually looks pretty cool. This was from open gymn. This thing helps her to learn how to flip backwards and to get her used to the feel of it. 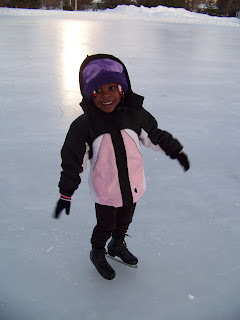 She loved this and did it most of the time we were there. 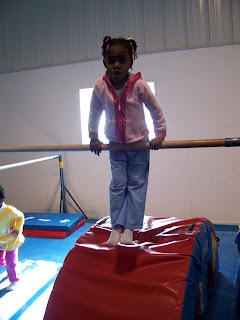 One thing they work with her on in developmental is being able to straighten her arms and hold herself up while working on the bars. That's what she's doing here and she's getting really good at it. Queen of the mountain. We have a pretty good sized snow pile in front of our house but the center is like a big bowl and she loves to go and play in there. 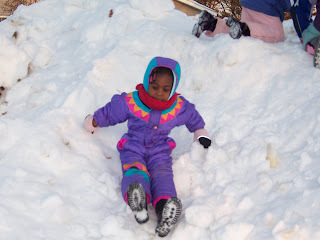 This is the pile she was sledding down but the snow was pretty hard and she couldn't go to far but she had fun anyway. She decided to go sledding with out the sled. 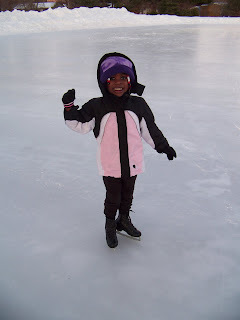 Here she is skating all by herself. She was so proud of herself and wouldn't let me even try to help her once I let go. She was all laughing and giggling. It was so cute! !